What was really great about the staff at Ansonia Lumber Co. was how quickly we received our materials. We got everything right when we needed it. My favorite part about Ansonia Lumber Co. is the service. The staff is really good. Just have to say that I've had great customer service with excellent quality material provided by Ansonia Lumber for my last couple projects. 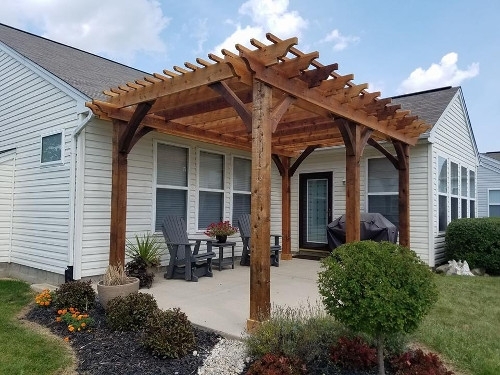 The pergola is awesome! Thanks, Mitch, for your helpful recommendations! Our company hired Ansonia Lumber to replace some old window blinds. Todd was very friendly and professional. He showed us a wide selection and all were reasonable priced. He had the new blinds installed in no time. A month later we hired them to do another set of windows. The staff at Ansonia Lumber Co are my favorite. I have been to many places around the world and I have never met people like Dave, Bill, George and the rest of the great crew. Ansonia completed a smaller project for us. Even though it wasn't real big, they really spent the time to talk to us and explain everything about the project. We really liked and appreciated that. I am so glad that we found out about your company. The people are amazing, helpful, friendly, willing to go the extra mile and willing to listen to anyting you have to say. JS Construction is building our barn and they have done an amazing job, and I highly recommend them and will definitely be referrring more to Ansonia Lumber!! Thanks everyone for making our barn building experience one that has been easy, amazing, and fun filled!!! We have recently upgraded the siding and roofing on our home, so we called Ansonia Lumber Co. We get a lot of wind at our home and the products have held up against the weather. The projects were completed in a timely manner and we received all of the supplies when we needed them. Great product and people that know what their products are. The staff at Ansonia Lumber Co. was great to work with. No matter what I brought to them needing help with, they were there to answer all my questions and run with my ideas. © 2019 Ansonia Lumber. All rights reserved.